From time to time, I take a look at off-the-beaten path search tools and search engines. In today’s roundup, I’ll take a look at Yometa, Blitter, Ozkope, Compfightm and Simploos (a very eclectic mix). 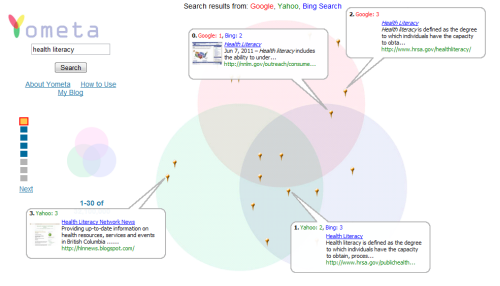 Yometa‘s more of a comparison engine than a search engine and what you’ll see in a Yometa search is how search results are ranked on Google, Yahoo, and Bing, using a Venn Diagram to display the output. If you’re interested in search engine rankings, the areas of overlap will be very interesting. If you’re interested in research, the areas of disparity might be interesting. Yometa’s a good reminder that search engines are not all alike. 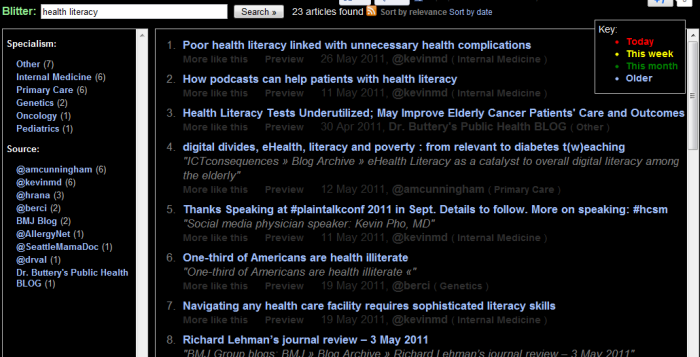 Blitter is a clinical search engine with content highlighted or commented on by clinicians who blog or tweet. It’s brought to you by the same folks who’ve developed the Trip Database, a clinical search engine whose results aren’t influenced by human curation. In Blitter, each contributor is identified by his or her clinical interest allowing users to filter results based on the speciality of the contributor. This allows the search to see the human perspectives at play in shaping the search results. It’s an interesting way of searching, at once enhanced and diminished by the fact that clinicians are the only source of health information. Oskope is a visual search engine so its focus is on searches where images matter, i.e., photos, products, and videos. You can search Flickr, fotolia, YouTube, eBay, and Amazon using this search engine. A nice feature of Oskope is its drag and drop interface which allows you to place images of interest into a folder for later review. If you register on Oskope, you’ll be able to save these folders. A drawback for Flickr searching is that you can’t filter by license so you have to go to the original link to determine if the image is available under a Creative Commons license. If you’re particularly interested in Creative Commons images on Flickr, Compfight is a good search engine to use. Though you won’t be able to zoom in on images, you will be able to quickly search through an image collection identified by tags, for example, and then go to the original source page to find out more about permissions (remember, not all Creative Commons licenses are created equal). A selection of royalty-free images is presented in a column on the right. Although it’s increasingly a Google world, resist assimilation when it comes to doing any sort of serious research and mix up your search engines! This entry was posted in instructional design approaches, search engine visualization, search engines and tagged Blitter, clinical search engines, compfight, flickr commons search, flickr creative commons, google yahoo bing comparison, graphic search engine, oskope, research tools, search engine, search engines, search venn diagram, simploos, Trips Database, visual search engines, yometa. Bookmark the permalink.